Thanks so much to Becky Arenivar from Prescott Public Library for this inspiring guest post! I am going to be purchasing this title for the IFLS Professional Collection, as well. Miss Becky was getting tired from the mental effort it took to hold the attention of her 3-5-year-old Storytime attendees, in the face of toddling toddlers, crying babies, and restless older sibs. With our small staff, Prescott Public Library offers all ages Storytime only, and sometimes it can be chaotic. We encourage parents to remove distracting children, but don't kick anyone out. I'd much rather have kids raising a ruckus in Storytime, than sitting at home in front of a screen. I'm supportive of parents bringing young children to Storytime - it's a great place for them to learn appropriate behavior, but, an 18-month-old can not be expected to behave like a 3-year-old until she is 3 years old. Pouch! by David Ezra Stein - every time the baby kangaroo hops out of the pouch, Miss Becky and the kids got up and hopped the same # of hops. I anticipated lots of extra hopping and trouble getting them to settle back down again, but, no worries - everything went smoothly. Joey by Jack Kent - before I started reading, I handed out paper, crayons and a cardboard piece to each child (our floor is carpeted), then told the kids to draw something they would keep in their pouch, if they had one. When I finished the book, we took a break from drawing to sing our closing song, and then kids and parents were invited to stay and finish their pictures. I've done 3 Storytimes so far using Books in Motion, and the results are substantial. For Boom Chicka Rock by John Archambault, we handed out our shakers (always a favorite with all ages) and shook them to the refrain, "Boom Chicka Rock, Chicka Rock, Chicka Boom!" at the end of every page. The added physical activity gives energetic kids more opportunities to move, and the art activities engage little hands and brains that start to get restless near the end of Storytime. We also do a craft once a month at the end of Storytime, and some kids are disappointed if it's not craft week. Adding a book-based art activity takes less than 10 minutes and turns those frowns into grins. 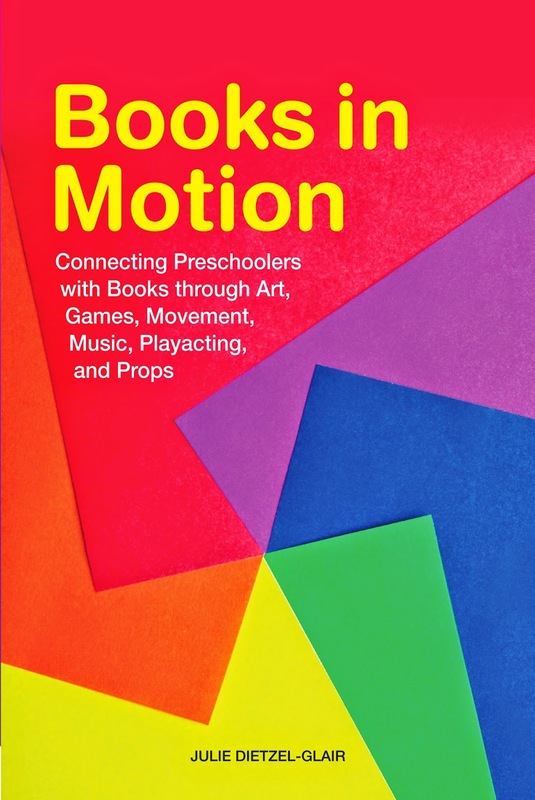 The very best thing about Books in Motion, though, is the creativity it has inspired and the enjoyment it has brought back to planning for Storytime. I have been inspired to come up with my own art activity for Joey, a book that Dietzel-Glair doesn't mention. Prescott will buy this book, so I don't have to hog Eau Claire's copy. And, I can't wait to start planning summer Storytimes!